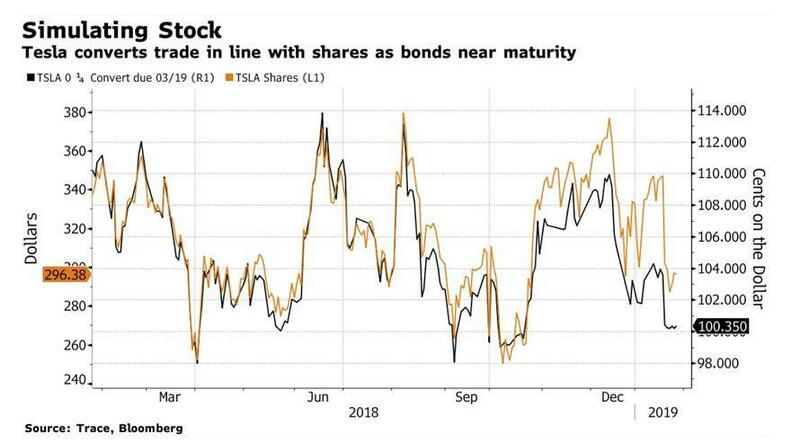 One of the ongoing sub-plots that Tesla saga participants have been watching closely has been how the company plans to deal with $920 million of convertible bonds that are maturing in just about four weeks, on March 1. As we exit January and head into February, the clock is officially ticking for the company to try and manage how it is going to pay off this debt, which could cost the cash flow-challenged company as much as $1 billion in much needed liquidity. 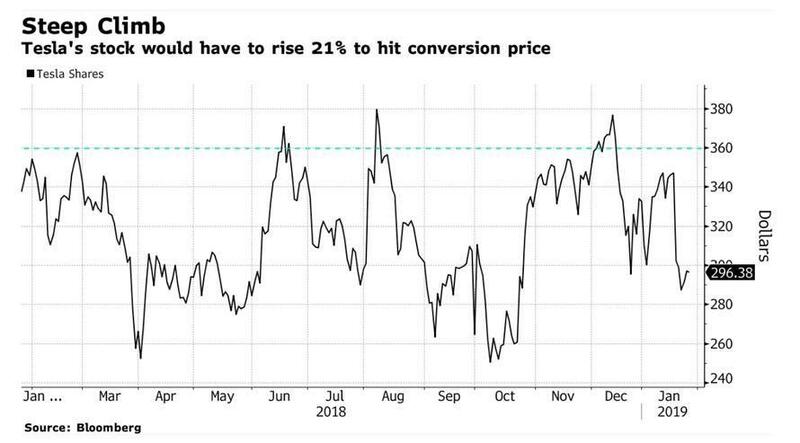 The bonds were issued back in 2014 and Tesla can pay them off with both cash and stock, but it needs shares to jump about 21% from current levels to trigger the convertible price, and for them to add stock into the mix. Otherwise, it's cash and carry. If they have to pay the entire $920 million bond off in cash, it would take a huge bite out of Tesla's cash balance. The one remaining potential catalyst for Tesla shares to move higher before maturity is going to be the company's earnings on Wednesday. Chris Hartman, a convertibles experts at Aegon Asset Management told Bloomberg that "there’s always a glimmer of hope. With the volatility that can happen inside this stock, the market is clearly saying it’s possible for that stock to be at, near, or above $360." Shares actually did eclipse the convert price milestone in December, when they traded as high as $376 on the heels of good third-quarter earnings and a report about the Chinese and US trade war potentially slowing down. But the stock has since tumbled, after the company announced plans to layoff 7% of its workforce and made statements like "the road ahead is very difficult", referring to its ability to make the low cost Model 3 profitably. Even if Tesla has the cash to pay now, its ability to be consistently cash flow positive again in 2019 without doing a capital raise - especially now that analyst estimates see them posting a loss in Q1 again - could be called into question. And so the company’s cash balance will certainly be in focus on Wednesday when it reports earnings. Tesla had about $3 billion of cash as of September 30, which is more than sufficient to cover the $920 million principle that it owes. The company has already stated its plans to pay off the debt instead of refinance it. It has also announced plans would be to pay off the maturity with a 50/50 mix of cash and stock if investors elect to convert. Bloomberg estimates that the company could have between $3.5 billion and $4.5 billion in cash by the end of this quarter. Still, as Hitin Anand, a Credit Sights analyst said, "they have the cash, but would rather have people convert. Will this put them in distress? No. But it won’t be ideal."